1. Ka Huliau 'Ana (composer Palani Vaughan, performed by KS oncert Glee Club - a song in priase of the voyages of the double hulled canoe, Hokule'a. LISTEN TO SAMPLE! 6. Pua Malihini (composed by Helen Desha Beamer KS 1900, arranged by Robert Cazimero) LISTEN TO AUDIO! 14.I Mua Kamehameha (by Charles King - originally called "The Hawaiian Rally Song" - was composed for use at football games, the title means "go forward Kamehameha", and is supposed to suggest the sound of the victory cry as Kamehameha marched into battle. LISTEN TO AUDIO! 15. 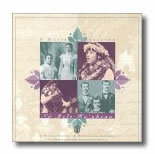 He Inoa No Pauahi- Birth Chant (a traditional birth chant praising the birth of princess Bernice Pauahi Bishop - "heavenly water of the gods, the favorite royal flower"
In this SECOND CD, the Alumni of Kamehameha perform. 11. Ku`u Lei Awapuhi/Pua Mae'Ole (my ginger lei/never fading blossom) LISTEN TO AUDIO! 14. Sicut cervas This bit of "Euro Western Classical Repertoire" always part of Kamehameha's curriculum, composed (by Giovanni Palistrina, Bob Springer [currently Superintendent/HeadMaster of Island School on Kaua'i] directing the Concert Glee Club Select Ensemble 1970 LISTEN TO AUDIO! 16. Hawaii Aloha -- a bit of "nationalistic sentiment" to close the evening, composed by Lorenzo Lyons in 1852, performed by the Concert Glee Club of 80/81 Dale Noble directing.